Fin·ny /ˈfinē/ , of, relating to, or resembling a fish. That pretty much sums up this Rainbow Trout design. The Finny Collection by Mojo Sportswear uses ComfortWeave™, which is a tightly woven poly fabric that also offers a sun protection factor of UPF 30, blocking 96% of the sun’s harmful rays. It’s because of this tight weave that the UV rays cannot penetrate, which means that the UPF rating will never wash out of the shirt. (read more about UPF ratings and Mojo’s commitment to sun protection here). 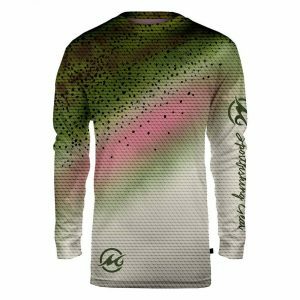 ComfortWeave™ also resists stains, odors and snags and although it’s softer than cotton, it wears like iron.If you are looking for a shirt that offers plenty of protection, breathes easy, and looks incredible, then the tuna inspired performance fishing shirt is the perfect fit. Add it to your collection of fishing shirts and you’ll see just how much it enhances your fishing experience.